4.2 Appraisal of Export Business of BASIC Bank Ltd. 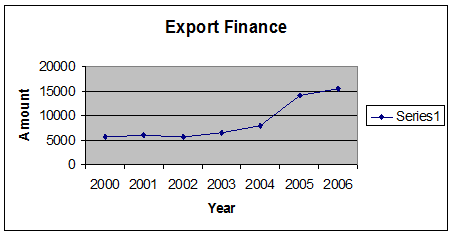 The above graph reveals that export finance of BASIC Bank Ltd. increased in 2001; 2003 to 2006, while there is downward trend in 2002. 4.3 Assessment of Import Business of BASIC Bank Ltd. The above table reveals that Import finance of BASIC Bank Ltd. in 2000; 2001; 2002; 2003 ; 2004; 2005 & 2006 were Tk. 7948.40 million; Tk. 7542.80 million; Tk. 8645.00million Tk. 8930.50 million; Tk. 12508.00 million; Tk. 11097.23million & Tk. 17804.27million respectively and average Tk. 10639.46 million and the annual growth rate is 17.71%. The above graph describes that there is an upward trend of import finance of BASIC Bank Ltd. in 2002 to 2004 & 2006 while there is a downward trend in 2001 & 2005. Evaluation of Foreign Remittance of BASIC Bank Ltd. The above graph (Graph-03) depicts that the foreign remittance of BASIC Bank Ltd. has been increased during 2001 to 2006. In foreign exchange business BASIC Bank Ltd. used the procedures that are usually used by other banks. In addition they use some safety material only for their foreign baking’s valued clients. They also buy the L/C on 10% reduced rate from their clients when their clients need money. By giving this facility to their clients they also earn for their banks and make a profit. The officers were mostly courteous, friendly in nature and eager to help despite the tremendous workload. As a 100% Government owned bank, BASIC Bank is trying it’s best to extend their service to the public. A very working environment was remaining in the BASIC Bank Ltd., Uttara Branch. During our long relationship with Uttara Branch, it is found that the Uttara Branch provides all kinds of commercial banking services to its customers. Foreign Exchange department rendering all the services related to international trade and remittance. Loans and advances analysis credit proposal and disburse credit if proposal is sound. General banking is engaged in cash receipt and payment, cheque clearing, local remittance etc. It is well established that theory without practice is blind. During the practical orientation we observed the function of General Banking, Foreign Exchange, and Credit department of BASIC Bank which will help us a lot to understand the overall banking. Out of the above discussion a conclusion can be drawn after saying that, the present customer dealing procedure is quite well at this moment. The computerized transaction makes the system efficient and effective. Document discrepancy charge varies form customer to customer. They don’t charge to prime customer. We think that the bank should review the customers’ behavior for a period of time and should develop a certain policy in this regard. When they calculate loan against documentary bill, they provide dollar rate $65.Which is lower than other bank. We think they should increase the dollar rate. In case of Export L/Cs, the Government encourages the exporters by giving different facilities like tax-cuts. We think the bank should also think about such type of facilities to be given to the Exporters because Bangladeshi Exporters like Readymade garments Exporters are going to face a tuff situation in coming years from the exporters of other countries. In case of Export L/Cs, sometimes customers insist to give their payments though their documents are found discrepant. In some cases, Bank has to give payment to these customers for different reasons. But it lessens the credibility of the Bank. We think the Bank should be as stricter as possible about giving payments against discrepant documents without hurting the customers. Over burden of work and ill defined assignment unable the employee to discharge their duties in cool manner. It is also creates a hazardous situation in the work process. So all the employee should be assigned with proper and specific assignment. They should expand their business more balancing way which means they should not focus on a particular industry like readymade garments industries. To communicate with the Negotiating Bank, Advising Bank. Reimbursing Bank the branch uses SWIFT. As well as these media the Bank could use the E-mail, which is cheaper and faster than those media. BASIC Bank Ltd. now using software and that is Kastle. It is very dedicated software. It has real time online banking, ATM facilities and E-banking and lot of more. So we think it will be a great progress for the bank. We think the Management should employ at least few more employee in foreign trade department as we have seen from our practical experience that many customers wait for a long time for any service as they see that only one concerned official is doing their best to meet the requirements of the customers but as the foreign trade procedure is designed with many small tasks.